These trendy tiles are an easy way to add flair anywhere in your bathroom, but they can be particularly useful in your shower, where the floor in sloped for drainage. Their small size easily covers the floor slope and the multitude of grout lines increases traction and reduces the risk of slips. You know subway tile, but do you know beveled subway tile? A modern twist on the classic block creates depth and visual weight, giving your bathroom or kitchen a bright, quilted look. Everyone loves a good chevron or penny tile backsplash -- and that's where they should stay! These small-scale, intricate designs are too busy to be used on the floor. Spice up the backsplash then choose a larger, more solid tile for the floor. As the size of the average person's bathroom has increased so have our floor tiles. 12x24 tile has become a popular floor option because of its size and pattern versatility. Line them up straight or stagger them across. It's up to you! 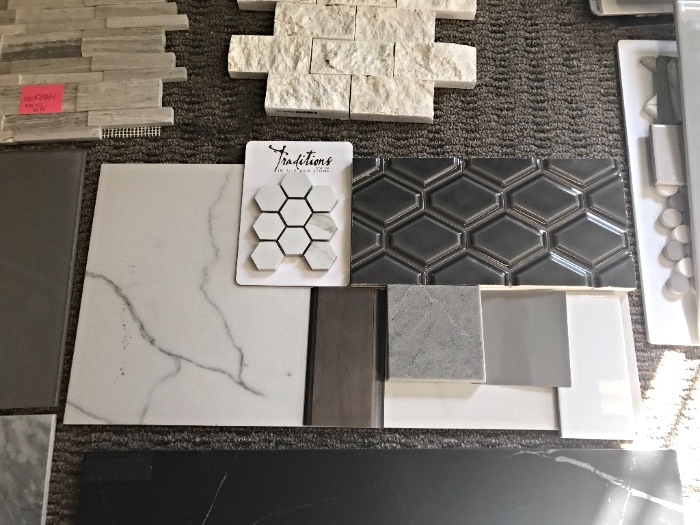 This month, we are taking on nearly a dozen kitchen and bathroom projects so it’s safe to say we are dreaming in tile these days. The real tile trend? Cool greys and crisp whites are dominating tile color palettes by bringing an airy, fresh look to bathrooms and kitchens. What’s your next tile project?